Facebook says it treats all product ads equally, but based on my selling experience I would say this is not the case. 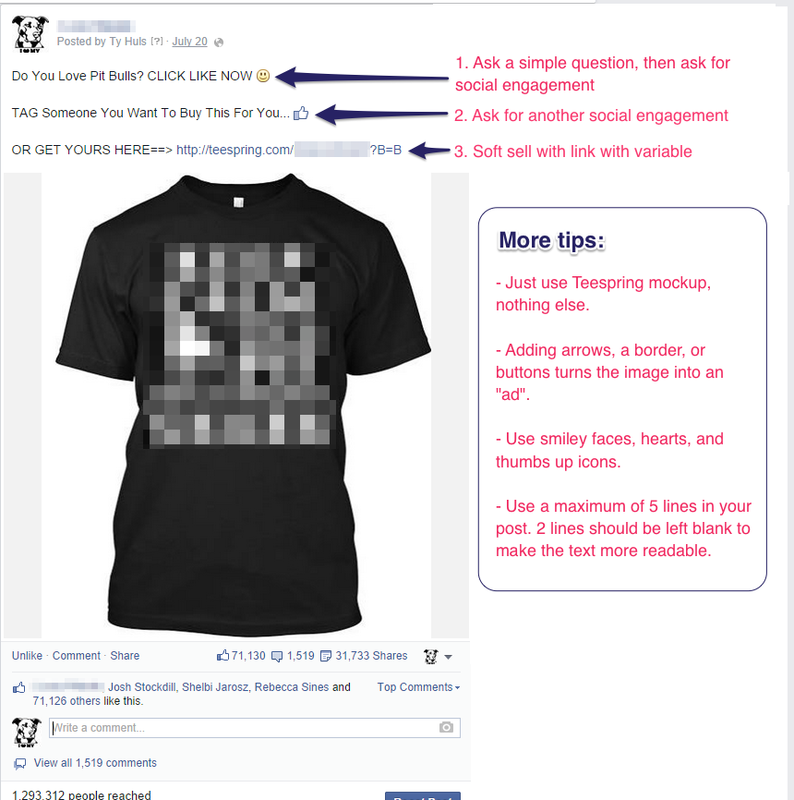 There’s a difference in how my t-shirt ads perform versus other product types, so for this post we’ll focus on ads specifically designed for selling t-shirts (and other upper body apparel—hoodies, tanks, long-sleeve shirts, etc.). There are two main types of posts you can/should make as a Teespring seller; link posts and photo posts. When advertising individual shirts you should always use a photo post. I recommend a photo size of 1200 x 1650 pixels. You can also add a call-to-action (i.e. “order now”) at the bottom or top of the photo since the overall size of the image is larger. Photo posts are different because when you click them, a “theater” opens up on Facebook to make the image larger. The user then has to click a link in the post text area (as I’ve described in tip number 2) if they want to navigate to the landing page. 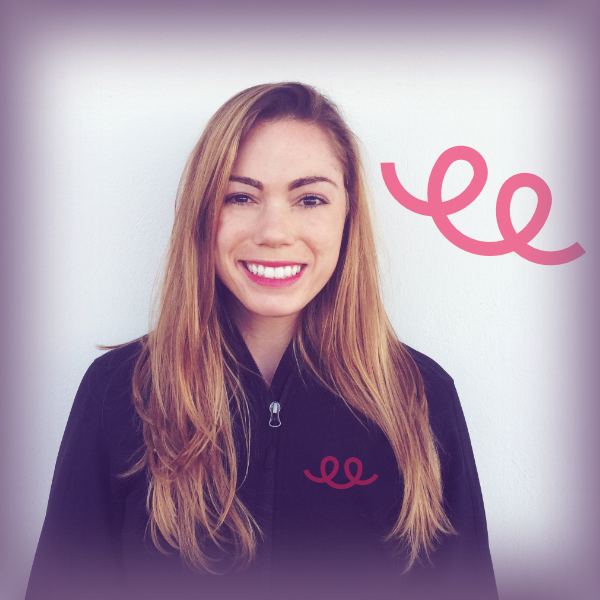 Photo posts require a two-step (two clicks) process for users to get to your Teespring listing. Link posts require one step (click) to get to the landing page (i.e. Teespring product page). When a user clicks the link image they’re taken directly to the website. Even though photo posts require an extra step from shoppers, they seem to work the best when it comes to generating more impressions, clicks, shares, etc. from your target audience. After you create either of these post types on Facebook, you can then pick the ad objective like PPE, Website Conversion, Lead Ad, Click To Website, etc. Keep in mind it’s good practice to add variables to your links (see GET variables) because they can help you differentiate which ads are driving which conversions. When creating a photo post ad, I would always recommend choosing “Website Conversion” as the ad objective. Of course, there are a few layers…but “Add To Cart” and/or “Purchase” objectives seem to work the best for me. and you don’t explain what the “links with variables” are or why you’re using them. Hey Karen – if you check the link we included at the end of number 2 it directs you to Teespring Analytics, where you can find more info on how GET Variables appear in your campaign analytics. This explanation might make a bit more sense. It’s a tactic many sellers use to keep the link at the top of the comments. Many times when a user sees something like this they check the comments to see what people are saying – and BOOM there’s the link (with link preview) where they can buy it! Do you need to be the first comment in the thread for this to work. Or if I comment like this on an old post will it push it to the top? Is this for a paid ad or a post you’re putting on a fan page, group or personal page? Hey Barry! The post is about paid ads from a page. Tip # 2 I tried this method. I’m a little discouraged. I have 830 likes, 210 shares but no sales. Is there anything more I can do? I tell myself that 830 likes, my design should not be bad. Hey Patrick – you may want to look through some of these past success stories. Some sellers provide specific numbers on ad performance. You can also try asking other sellers in the Teespring forum. 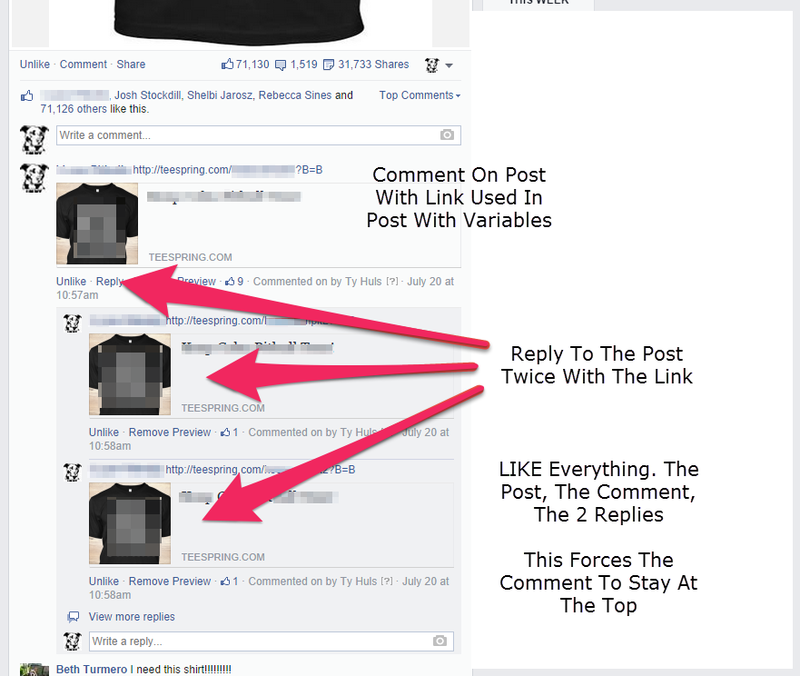 I dont get where to post the url of the t shirt on facebook? Can someone help me. There are two options when creating an ad and I always get confused which one to use. Should I publish a post on my Fan Page and make an ad out of that, or should I create an “advertisement”? I have a question ? What are the best interest to choose when selling t-shirt and how many interest should I add per ads ?